This Charcoal Swirl Glass Shade easily pairs with any fixture for a custom look. You can also use it to transform your existing lighting for an instant makeover. The shade features a pottery-like shape and charcoal-on-white swirls for a marbleized appearance. This shade is ideal for bathrooms, kitchens, hallways, and other interior areas. It measures 5 inches high by 4-3/4 inches in diameter and has a 2-1/4-inch fitter. This delightful Chocolate Drizzle Glass Shade easily pairs with any fixture for a custom look. You can also use it to transform your existing lighting for an instant makeover. The shade features a tapered shape and white glass topped with a chocolate drizzle pattern for a sweet appearance. This shade is ideal for bathrooms, kitchens, hallways, and other interior areas. It measures 6-1/4 inches high by 4 inches in diameter and has a standard 2-1/4-inch fitter. This Textured Black Glass Shade easily pairs with any fixture for a custom look. You can also use it to transform your existing lighting for an instant makeover. The shade features a textured black on white pattern, and when lit, it produces a beautiful glow. This shade is ideal for bathrooms, kitchens, hallways, and other interior areas. It measures 11-1/2 in. by 5-1/8 in. (H x D) and has a standard 2-1/4-inch fitter. 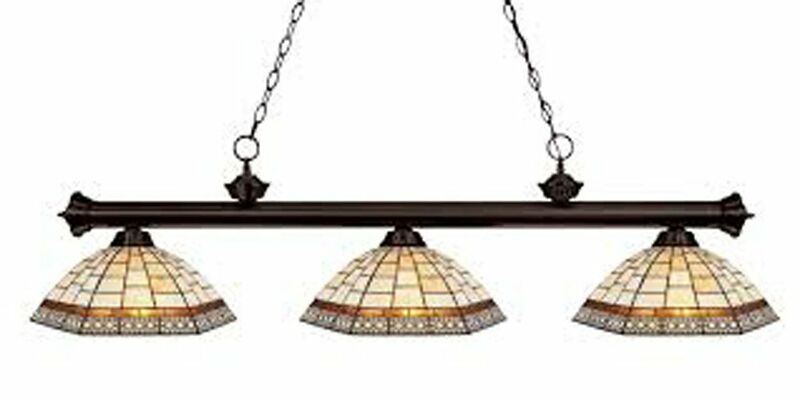 3-Light Bronze Dimmable Island/Billiard with Multi Colored Tiffany Glass Shade - 57 inch This island/billiard will update your home with its eye-catching design. Featuring a bronze finish and multi colored tiffany shade(s), this fixture will accommodate a variety of dicor styles. With its easy installation and low upkeep requirements, this island/billiard will not disappoint.